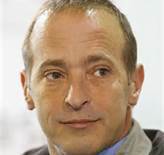 Grammy Award nominated David Sedaris is a very pop[ular, highly respected American humurist, comedian & author, whose respect is reflected in the packed out response to his week long soiree at the Edinburgh fringe. His shows involves his reading of several pieces of writing which highlight his view on the little things in life, like buying his longt-term partner a special valentine’s gift, & the visit of his sisters to his East Sussex home. At every turn he injects his highly-tuned comedic mind , in a fluid, lyric conversational style, which has compelled me to pick up one of his books & read him for myself.